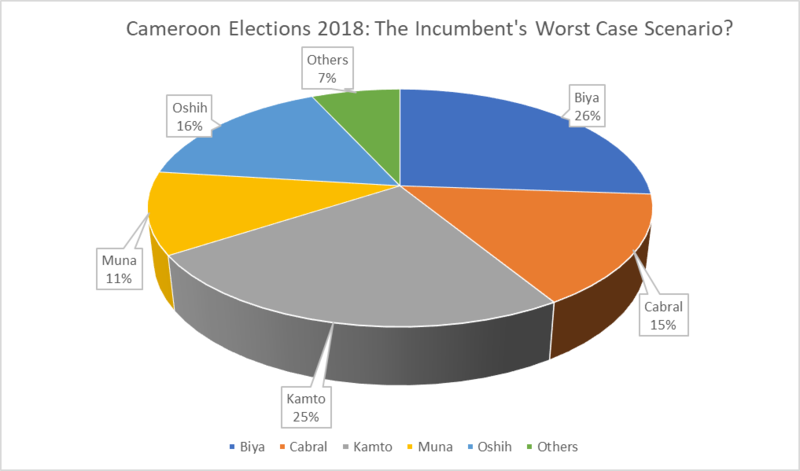 Home › Politics › Cameroon’s Election 2018: What Outcome In The Incumbent’s Worst-Case Scenario? • A 50% vote share in the Centre region against the current field of the other 8 would be a “must achieve” for the incumbent. Below 50% in the Centre the arithmetic quickly becomes very tricky for the ruling party. • In this scenario where the regime’s vote in the Centre is under pressure for a massive reversal, it would need to hold its ground in the Extreme North at about 35%. Below which the outcome of the poll may not be favourable. • The South which has the least number of registered voters is the third leg of the tripod on which the regime stands. It would need to shore its vote at about 40% to retain overall lead in the event of a continuum of sub-optimal results in the rest of the regions. • Victory in these three regions, and perhaps par in all but NW, SW and Western Regions where a rout is predicted, could still guarantee an overall victory for the regime of about 26% in the poll. Expect the regime to throw everything at these three regions to get out the vote. • No prizes are awarded for saying a coalition would defeat the regime. The question remains, which coalition? Independently, Mr. Libii would split the home vote for the ruling party – but by how much is a crucial question which will determine if the regime survives the poll. While coalitions have been sought and are still being sought – one such coalition involving Mr. Libii but without him as leader, may not work out so well as it may serve simply to galvanise the home base for the ruling party. On the other hand, a coalition with Mr. Libii at the helm, may be off-putting for those in the regions, who are voting to take power from Cameroon’s current political elite hailing mainly from the Centre region. It also a no-brainer that Mr. Osih and Mr. Muna are taking votes from each other and ostensibly, a coalition between the two would stand to reason, yet, from the simulation, would not win either the poll as they each or both need a coalition with francophone candidate(s) to keep their vote-share and broaden their appeal. A strong showing for Prof. Kamto at home is necessary to boost his chances. Like the incumbent, Prof. Kamto needs his voters to come out without reservation. One curiosity of the registration stats is in the Western and North Western Regions where the Male/Female proportion show more Females being registered than males. Noteworthy that in certain regions e.g. Littoral the Male/Female proportion varies up to 35% above the 1.01 Male/Female proportion in in the population at large. But, on polling day, it is generally known that women are crucial in bringing out the vote and this may in turn make all the difference. The simulation reveals Prof. Kamto’s chances improve over a struggling incumbent if say the Extreme North vote for the incumbent sags to 30% versus an incremental 3% outturn in the West Region by supporters of Prof. Kamto will tilt the outcome in favour of the Renaissance Movement. Given the crowds seen in his recent rallies, both in the Extreme North and the West, this is entirely within a stretch of imagination. Prof. Kamto may therefore, given the right circumstances, emerge the last man standing in this poll, and without need for a coalition. The troubles in the NW/SW regions have rendered the two regions near irrelevant and almost certainly floored the candidatures of both Mr. Osih and Mr. Muna. From the simulation, there’s no credible Anglophone path to power except of course in a late coalition which leaves an Anglophone as its leader. The situation is quite a paradox because the regions’ troubles, began as a protest contra the marginalisation of its peoples. 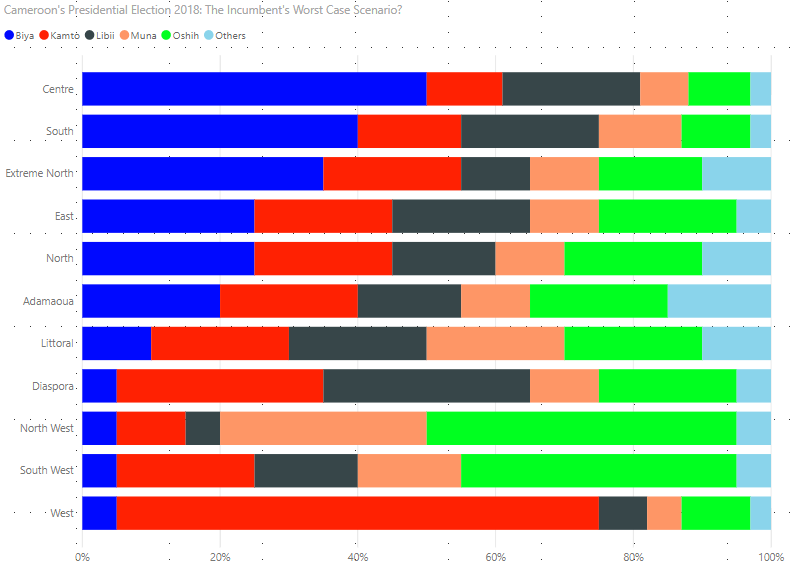 But in a perverse turn of events the troubles have led to one of the biggest marginalisation of all – being denied a credible chance at the presidency or having a stake in the process or outcome because, bizarrely, this quick and dirty simulation reveals, the fewer the Anglophone participation in the election the better the chances for the incumbent! Reactions to the exercise reported in this article are entirely predictable. First are those who would scoff, point wagging fingers and level accusations of mischief making. There are others who would shrug, ask why the fuss, as the outcome of the poll is inevitable, a foregone conclusion. The last cluster of critique would come from those who choose to dismiss it for lack of sophistry. True there are many different ways this could be done with a range sophisticated tools which, take on board many different variables to build machine learning models etc. Nevertheless, the driver for the exercise was the simple question, “What If?” and trying to answer this has been an eye opener for a key contention that an opposition party could not win without a coalition. The simulation captured here shows that the possibility does indeed exist and everything is up for play, if the players are ready and the field is fair. By Lloney E. Monono, UK. ‹ Revisiting Orwell’s Farm, Amba Farm.